During the first round of the JTG-make trophy, the Italian importer Maximum Petrella hosted the 7-time World Champion Jordi Tarres creator of the new bike Spanish. An 'opportunity to exchange a few words with one of the greatest of all time was not to pass up, and then accepting the invitation we ended up having dinner in a typical restaurant of Lecco. The intent was to conduct an interview, but since the development of the evening I decided to talk and discuss the trial in general along with all the other guests friends. With Jordi has been talked about a bit 'of everything from motorcycles, the Italian and Spanish governments, the current situation of the SUV. The engine, JTG, modern technique of driving, non-stop and so on. Very nice as always Jordi has not failed to make jokes and anecdotes lived and even some jokes. Beautiful one that explains how to take viagra the Catalans (notoriously stingy), but we'll talk about another time. Speaking of the current situation of the trial he confessed to us that although does not agree with the non-stop, he said something needs to be done to try to attract new people and new young. Certainly agrees that the major limitation to the development of the trial are the restrictions by the institutions and environmentalists toward the off-road vehicles in general. its proposal as regards the regulation criticized by all the drivers, it would be a non-stop with the ability to make at least one stop in the area without penalty. He is also fully aware that with the new regulation no stop judges are most adversely affected but also invested with too much decision-making power, so it can affect their judgment with the results of a competition or even the championship. Absolutely contrary motion that weigh as much as they would like some international executives, he is convinced that the technique needs to evolve and not involversi. If you put limits to the weight of the ballast in the world will put tells us, but for the normal buyer will provide a motorcycle getting lighter because that's what the fans want. Speaking of jtg confessed that the first versions had a little 'problems, but it is normal routine for a small company of a few people with limited production pieces. These problems were gradually solved with the appropriate changes and now the bike has reached a satisfactory level of reliability and overall performance. Approximately 100 bikes per month are the current production is coming JTG and also 125, are already prepared both the crankshaft and the cylinder and the gearbox, short start the first test. The injection on jtg? According jordi will be a future goal but only dictated by European regulations. The project JTG tells us, is especially marked on simplicity and ease of maintenance by the mechanics of end users. In his opinion, a carburetor is much more manageable by anyone compared to a programmable power where it's needed to force a computer. Whenever you make a change you have to work a lot on the program to find the best compromise. Maybe, we confess, when it will be possible to program the unit with the phone will be much more manageable, so if you're at 2000 meters and change the carburetor uses the phone to change mapping, but at the moment with 2 jets and 2 adjusting screws get much faster what you want from your engine without being a computer genius. Many wonder why your nephew did not remain with you .... My nephew has embarked on a career as a professional and even if we remain in good relations, decided to go where he had at the time more economical possibilities. We are a small company and the few funds that we want them to invest in the development of our products. A driver in the world is very expensive both in terms of money that expenditure of energy and at the moment we prefer to concentrate on something else. Speaking of new amendments tells us that they are thinking about the possibility of mounting on the part of users of different weights on the flywheel of future models, a bit 'like Fantic of the golden years. The customization of the bikes we realized that is what users want and then try to please them as much as possible. Speaking a little 'technical output is also the opinion on the materials used currently. According jordi what would have to be improved especially the tires, according to him it is unthinkable that a rubber weights 6 kg, even more than their frame, but then it is clear that Michelin no real direct competition does not invest in technology for the sale of a few numbers. 2-stroke or 4 stroke? There are pros and cons in both engines. The 2-stroke is much simpler to realize, the 4-stroke is much heavier but is more reliable. The 2-stroke is less expensive in the preparation but it is much more prone to seizures because of the transfer ports. 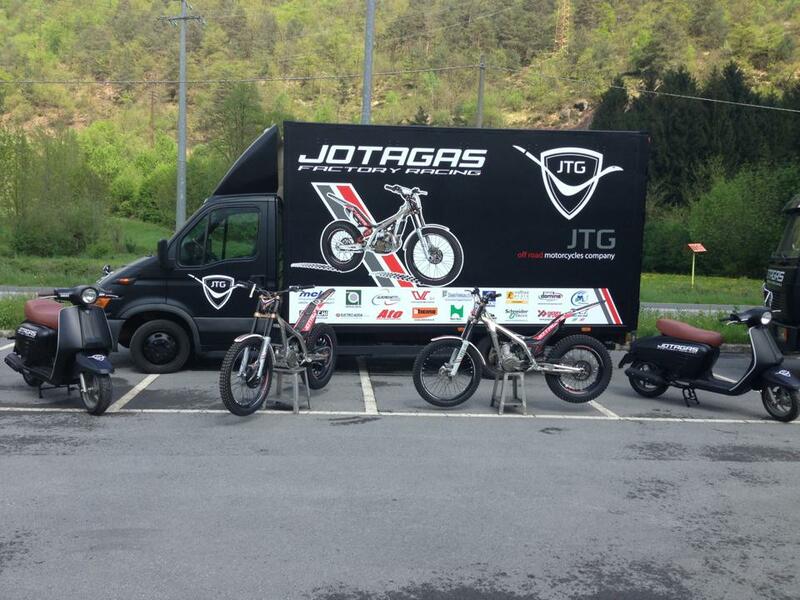 The project JTG as I said, is based on simplicity and with a 4-stroke would be unthinkable for us at the moment because of the costs of development. Even an engine already done it would cost too much to get maybe the same performance. 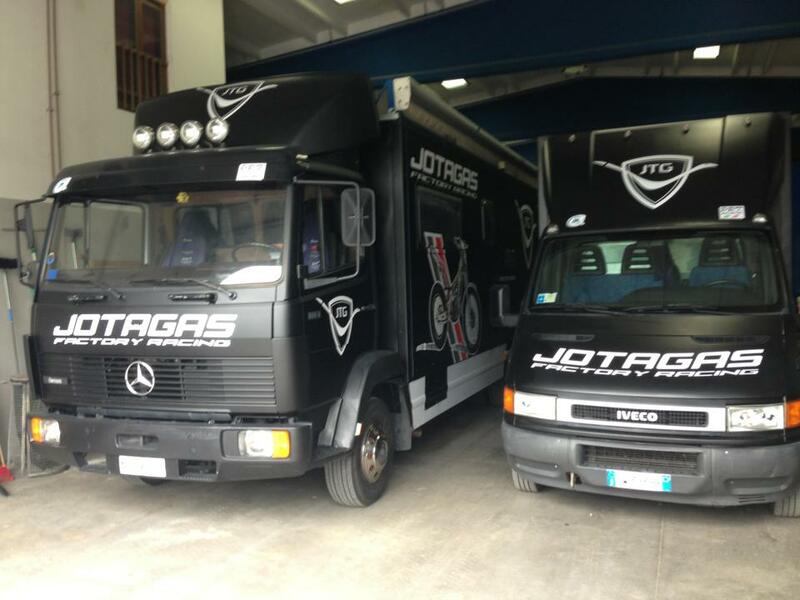 Ours is an engine all made in JTG, an all-new design with components made in spain Spanish and Italian. The only Chinese components are the 2 outer casing made of magnesium. For now, apart from the first specimens seems to be a very good project, but has the possibility of future development not indifferent. Someone asks what is in Italy and if he is happy to go back. Italy is my second home says; Jordi Tarres was born in Italy with an Italian bike, the Italian public has always loved me and are always happy to come back as soon as I can. I love Italy as a country and I like Italians, such as character and happiness are very similar to us Catalans. Then his gaze gets a little 'dark: I am very sorry for the loss of two great people and friends like Diego Bosis and Giulio Mauri, with them I spent most of my sporting life and their death saddened me a lot. Between courses and a glass of wine (good wine he likes bikes) you continue to talk about trial and exits the discourse on modern single-wheel driving. I really like this guide, the first few times we have experienced myself and Adam Raga in training, it was just fiddling around 'but we realized that putting all the weight of the rider and the bike on the rear tire grip was to maximum, and then we developed the guide then followed by all the others. Then it was that Toni has further exacerbated this guide helped by the type of bike is able to use his bike as the bike. A guide serves very difficult to learn a lot of technique and a lot of sensitivity, but that allowed him to win many races, especially indoors. In the natural is a technique that is used much less. Also published the speech of young players and the future ... in Spain there are some children who are growing but the road is very difficult, even in Spain there are problems with environmentalists and with the economic crisis, it is also almost unthinkable for an emerging with few economic opportunities to the professional and go out to practice every day with the following one or two paid staff. Without continuous training the gap between the top of the world and everyone else is getting bigger and this certainly does not help in the trial. I go back to the speech that you must do something but there is certainly a recipe. With pleasure I find that always reads mototrial and judges our site one of the most beautiful and complete in the world. Thank you. End the evening with a beautiful cake with a printed picture of her. Jordi Thanks for the sympathy and friendliness that are part of the rest of your history, great champion.